I've often recommended to wildlife photographers (on safaris I guide or online) that they should shoot wider to include more of the scenery, rather than merely trying to get as close as possible for as much detail as possible. One of the reasons I say this is that a very tight headshot could actually be taken anywhere (like in a zoo). Framing wider tells your audience a bit about WHERE the animal or bird found itself and WHAT it was doing. This does not always mean you should whip out a shorter/wider lens...sometimes it just means using your telephoto lens and not driving right up to your subject. I'm a big fan of using the compression factor that comes with the super telephoto lenses to tell stories and enhance the overall composition by seeming to bring the compositional elements closer together than they really are. The photo below shows such an example. 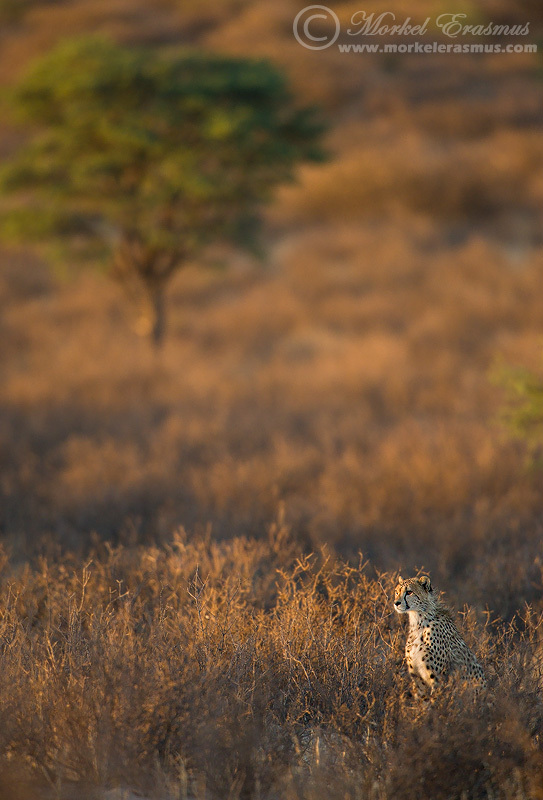 This male cheetah was photographed in the Kgalagadi Transfrontier Park (Kalahari desert), and was scanning the Nossob riverbed for a potential breakfast target. The sun was just coming up and the light was sublime. I particularly liked how it was lighting up the shrubs and grasses around him, and a the camelthorn acacias in the distance. I chose to frame vertically (portrait orientation) to include the tree. Thanks Jim! Of course I was advocating a "both and more" approach, not an "either or" approach. I too try and nail both types of images in a sighting. Pragtige foto Morkel. Die Kgalagadi stel nooit teleur nie. Kan nie wag om die Groen Kalahari die 15de Maart te besoek nie.